We welcome the introduction of the newest rule release from Talos. In this release we introduced 11 new rules and made modifications to 5 additional rules. We welcome the introduction of the newest rule release from Talos. In this release we introduced 52 new rules and made modifications to 9 additional rules. With our recent release of Snort 2.9.9.0, as I stated in a previous blog post, this marks the beginning of the "end of life" for Snort 2.9.7.6. We've updated the Snort EOL page today which marks the EOL for 2.9.7.6 (2017-03-14). If you are interested on our "LTS" or Long Term Support version of Snort (2.9.8.3), I suggest you plan your migrations now. 2.9.8.3 will be supported until the next major release of Snort after 2.9.9.0. If you want the newest features of the ruleset and Snort, we suggest you upgrade to 2.9.9.0, which is our current release. For more on the features of Snort 2.9.9.0, please read out blog post. Please remember, as per my previous blog post, 2.9.9.0's ruleset will not be backwards compatible to Snort 2.9.8.3 once the newer keywords are used. We welcome the introduction of the newest rule release from Talos. In this release we introduced 32 new rules and made modifications to 1 additional rules. 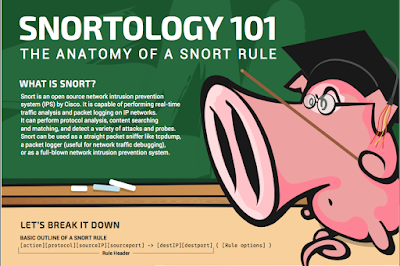 We've uploaded the new version of the Snort Manual pdf to the documentation section of Snort.org. Please have a look at the new manual! We're preparing for our newest release of Snort, version 2.9.9.0. As always, I try to let you all know as soon as I can on major version upgrades, as the release of 2.9.9.0 will activate the 90 day EOL trigger for 2.9.7.6. Since 2.9.7.6 is what we consider our Long Term Support or "LTS" version, and there are about 150,000 users on this version, there are a ton of people that need to upgrade. Snort 2.9.8.3 will take over as our LTS version as 2.9.9.x marches forward, and as always, we encourage people to stay on the most current version. Snort 2.9.7.6 was released September 30th of 2015, with no less than 144 rule updates in that year. So, for those of you on 2.9.7.6, if you do not want to move to the "edge" version of Snort (2.9.9.x) when it is released, I suggest you start moving to 2.9.8.3 now. Following an upgrade and prior to turning off support, I'll send out an email to all the people who are downloading older versions of Snort rules, and encourage them to upgrade. We welcome the introduction of the newest rule release from Talos. In this release we introduced 20 new rules and made modifications to 4 additional rules. Talos has added and modified multiple rules in the exploit-kit, file-executable, file-office, file-pdf and server-webapp rule sets to provide coverage for emerging threats from these technologies. We welcome the introduction of the newest rule release from Talos. In this release we introduced 8 new rules and made modifications to 11 additional rules. We welcome the introduction of the newest rule release from Talos. In this release we introduced 7 new rules. A coding deficiency exists in Mozilla Firefox that may lead to remote code execution. A rule to detect attacks targeting this vulnerability is included in this release and is identified with GID 1, SID 40888. We welcome the introduction of the newest rule release from Talos. In this release we introduced 13 new rules and made modifications to 6 additional rules. Recently on Snort's Twitter account, we posted a picture of an infographic that one of our talented graphic artists Wendy created, and the response was fantastic. It doesn't explain every rule option, but it is a fun art piece for your cube or office! So, we've made it available for download on Snort.org, under "Official Documentation". If you'd like to download and print it, we recommend a thick paper stock "mini-poster" type print, perhaps in an 11x17. Please do not redistribute or sell these without OUR permission, you do not have authorization to do so. Copyright Cisco and/or its affiliates. Snort, the Snort and Pig logo are registered trademarks of Cisco. All rights reserved. We welcome the introduction of the newest rule release from Talos. In this release we introduced 42 new rules and made modifications to 7 additional rules. We welcome the introduction of the newest rule release from Talos. In this release we introduced 18 new rules and made modifications to 24 additional rules. Some users may not be aware, but you've been able to report false positives on Snort.org for years. I say that users may not be aware, because quite unintentionally, the feature wasn't very easy to find. With today's rollout of version 5.1.1 of Snort.org, hopefully, we've fixed that. then clicking on your email in the same section after logging in, you will be taken to your User Preferences and information screen. Including a new link at the bottom of the list for "False Positive". 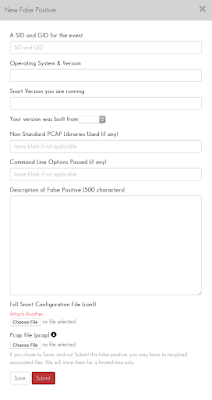 When you fill out this form and click submit, the pcap and description will enter directly into our analyst's queue for work, allowing us to process false positives quickly. In a future version of the Snort site, we are going to tie this feature directly into what we call, the "Analyst Console" here at Talos. 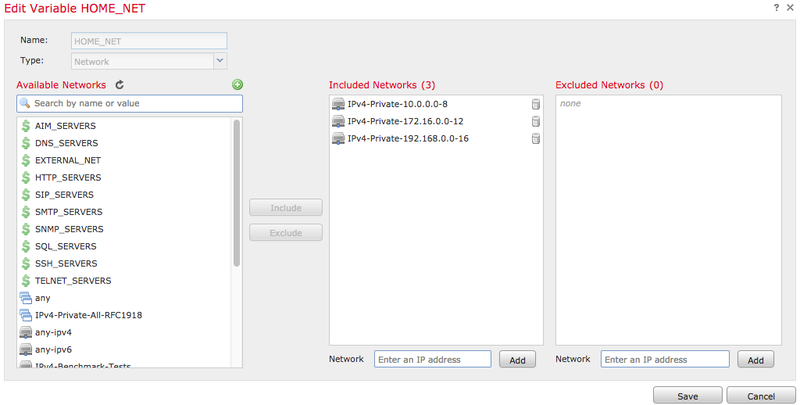 Allowing you to see the status of your false positive, as it is flowing through our system, automatically. Allowing you to see when the rule will be fixed, and when it was released. In the meantime, please use this system for your FP reports, help us improve the feature! We welcome the introduction of the newest rule release from Talos. In this release we introduced 31 new rules and made modifications to 10 additional rules. As part of our efforts to enhance the customer experience and better suit the account management needs of our Integrator customers we’ve revamped our Snort Integrator system on Snort.org! In this new upgrade our new sub-registration process will give Integrators the ability to link active licenses to their master account via the Snort.org account portal. To accommodate the wide range of sub-user management needs, we have created options that allow our integrators to add customers manually via the Integrator Manager for smaller businesses. This can also be done through the Integrator API which allows our customers to add numerous sub-users at once, accommodating the needs of much larger businesses. This will allow our integrators to couple the user provisioning for the customer’s oinkcode directly into their own user provisioning systems for easy automation. As a benefit, the addition of this exciting new feature allows integrators to add and suspend their specific users, as needed, without interrupting the service for their other customers. We have also provided extensive documentation and example code written in Perl that can be used with our system to easily utilize the new integrator features. 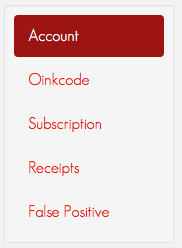 All of this documentation can be found on your Integrator Account oinkcode page, after logging into Snort.org. As our Integrator program continues to grow, our Snort.org team is constantly striving to evolve our program. Our team aims to evolve the program in ways that will not only increase our customer satisfaction and partnerships, but prove mutually beneficial for the business management needs of our integrators. You can view our most current list of integrators by clicking here. If you are interested in becoming a Snort Integrator please email snort-sub@cisco.com for more details on our program. We welcome the introduction of the newest rule release from Talos. In this release we introduced 16 new rules and made modifications to 4 additional rules. Talos has added and modified multiple rules in the file-other rule sets to provide coverage for emerging threats from these technologies. The newest version of PulledPork has been released and is available for download from the PulledPork Github repository! This release fixes several bugs. For those of you that haven't updated their version of PulledPork in awhile, this will fix many download issues you may have with the blacklist and official rulesets from Snort.org. Everyone using PulledPork should grab it, and for the stragglers left that still use oinkmaster, you should start upgrading too. For those of you that have oinkmaster configurations, you'll see in the contrib directory, a community member has submitted a small perl script that converts your oinkmaster configuration files to pulledpork configuration files. Please start your upgrade engines, as Snort 2.9.9.0 should be released soon, and you'll want to be ready! The October winner of our monthly signature contest for the community ruleset is Yaser Mansour! For more information on how to get involved and how you can win your Snort prizes, please take a look at our blog post. Good luck to all of those submitting rules in the upcoming months. We'll soon be revamping our signature contest (prizes included) so be sure to check back with our blog for updates! We look forward to a great November and beyond! We welcome the introduction of the newest rule release from Talos. In this release we introduced 28 new rules and made modifications to 4 additional rules. Talos has added and modified multiple rules in the file-flash, file-office, file-pdf, malware-cnc, policy-other and server-webapp rule sets to provide coverage for emerging threats from these technologies. We welcome the introduction of the newest rule release from Talos. In this release we introduced 32 new rules and made modifications to 9 additional rules. Snort++ build 217 is now available on snort.org. This is the latest monthly update available for download. You can also get the latest updates from github (snortadmin/snort3) which is updated weekly. Available now for download from our downloads page, we look forward to you downloading and using the new features of 2.9.8.4's OpenAppID preprocessor and sharing your experiences with the community. We welcome the introduction of the newest rule release from Talos. In this release we introduced 35 new rules and made modifications to 6 additional rules. Another thanks goes out to Bill Parker, the author for many of excellent Snort guides. Integrating Snort 2.9.8.x with AlienVault's OSSIM installation guide can be found on our documentation page, so for those of you interested in OSSIM, but are unsure of how to get started, or how to integrate Snort into the offering, please go take a look. As always, we thank Bill for his documentation contributions, and welcome all documentation contributions for the Snort.org page! In previous blog entires you've heard me talk about the need to stagger your crontabs to lighten the load on Snort.org at certain times of the day. 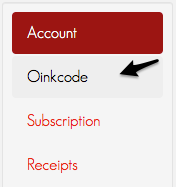 We've taken the liberty of creating a section on the oinkcode page about how to configure your crontab. If you log into Snort.org, click on your user account email address (found at the top right of the page). This will give you some default syntax for your crontab entry, along with a randomized time (it changes every time you refresh the page, so you can actually place a different time on all your sensors if you so choose) for pulledpork to execute. Please replace your crontab entry with one of our randomized times from the website, and that should lower the loads on downloads. We welcome the introduction of the newest rule release from Talos. In this release we introduced 27 new rules and made modifications to 0 additional rules. We welcome the introduction of the newest rule release from Talos. In this release we introduced 25 new rules and made modifications to 50 additional rules. We welcome the introduction of the newest rule release from Talos. In this release we introduced 30 new rules and made modifications to 5 additional rules. We welcome the introduction of the newest rule release from Talos. In this release we introduced 18 new rules and made modifications to 2 additional rules. We welcome the introduction of the newest rule release from Talos. In this release we introduced 13 new rules and made modifications to 2 additional rules. We welcome the introduction of the newest rule release from Talos. In this release we introduced 86 new rules and made modifications to 18 additional rules. The September winner of our monthly signature contest for the community ruleset is rmkml! We welcome the introduction of the newest rule release from Talos. In this release we introduced 20 new rules and made modifications to 6 additional rules. We welcome the introduction of the newest rule release from Talos. In this release we introduced 17 new rules and made modifications to 2 additional rules. Snort++ build 213 is now available on snort.org. This is the latest monthly update available for download. You can also get the latest updates from github (snortadmin/snort3) which is updated weekly. Snort++ is very close to overtaking Snort 2.X and with any luck Alpha 4 will be completed with the next monthly release. If you haven't tried out Snort++ now is a good time to do so. We welcome the introduction of the newest rule release from Talos. In this release we introduced 11 new rules and made modifications to 20 additional rules. Just a notification to remind everyone that Snort 2.9.8.2 is now End of Life (EOL). In accordance with our EOL policy, 2.9.8.2 met its EOL date today. Now it is time to upgrade your engines, Snort 2.9.8.3 is the current version of Snort, and users should upgrade immediately. We welcome the introduction of the newest rule release from Talos. In this release we introduced 23 new rules and made modifications to 73 additional rules. We welcome the introduction of the newest rule release from Talos. In this release we introduced 12 new rules and made modifications to 2 additional rules. The EOL for Snort 2.9.8.2 is approaching in a couple days. From our download statistics, the percentage of people is pretty small. Please try and update your engines this week to 2.9.8.3, the current version. We also look forward to the release of 2.9.9.0 in the coming weeks, so for those of you still on 2.9.7.6, the EOL for 2.9.7.6 will be the release of 2.9.9.0 + 90 days (as a reminder). So, 2.9.7.6 users, your EOL is coming too, and there are tens of thousands of you on that version. It's upgrade time! We welcome the introduction of the newest rule release from Talos. In this release we introduced 36 new rules and made modifications to 6 additional rules. Talos has added and modified multiple rules in the blacklist, exploit-kit, file-flash, malware-cnc, malware-other, policy-other and server-webapp rule sets to provide coverage for emerging threats from these technologies. We welcome the introduction of the newest rule release from Talos. In this release we introduced 31 new rules and made modifications to 2 additional rules. We welcome the introduction of the newest rule release from Talos. In this release we introduced 85 new rules and made modifications to 12 additional rules. lead to remove code execution. this release and is identified with GID 1, SID 40129. 40114 through 40115, and 40127 through 40128.
this release and are identified with GID 1, SIDs 40144 through 40145. Scripting Engine that may lead to information disclosure. this release and are identified with GID 1, SIDs 40149 through 40150.